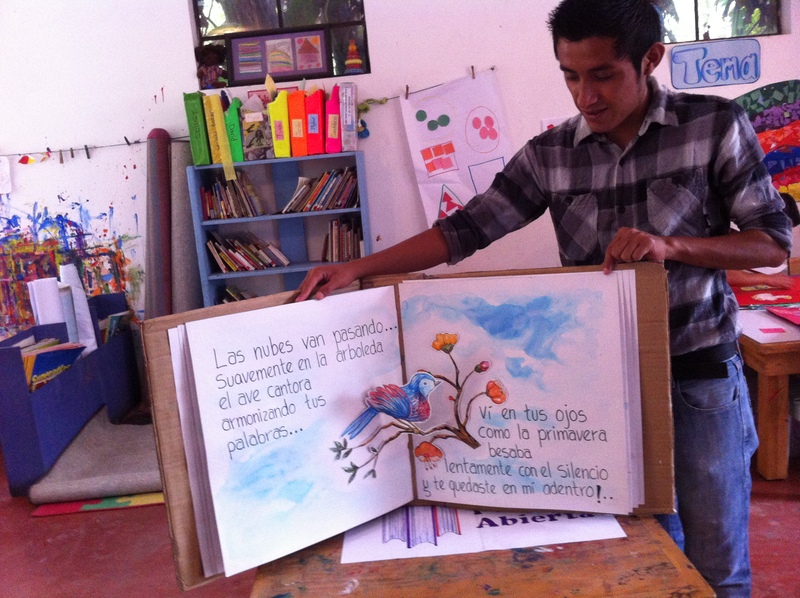 In 2014, La Puerta Abierta’s Traveling Library reached out to 8 schools, 5 different grades, 25 classrooms, 40 teachers, and 400 students on a weekly basis! 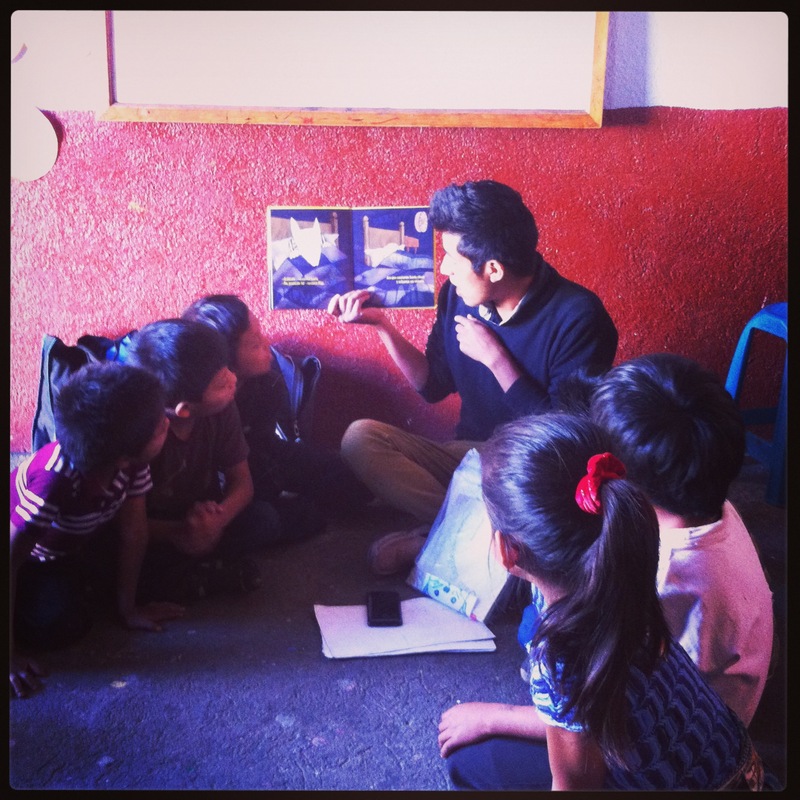 Today, we want to share with you glimpse of our program through eyes of our Traveling Library Coordinator Isaias. It’s 7am in Santiago Atitlan and the pueblo is beginning to come alive with food vendors in the market at the town square, agricultural workers heading off to the fields, boats filling up and leaving the docks carrying passengers to other destinations. Isais, our traveling library coordinator extraordinaire, crosses the town square carrying a backpack full of books and a bag of art supplies. He heads to the local pick-up stop and squeezes into the back of a truck crowded with other passengers. This is the vehicle that will carry him down twisted dirt roads to his Wednesday school in Chacaya. Arriving in Chacaya, Isais is immediately surrounded by students, happily cheering “Profe Isais!”, giving him hugs and high fives, while jumping up and down with excitement. Isais is equally enthusiastic with the students, who he hasn’t seen since last week’s visit; he makes conversation with them as they walk into their classroom. 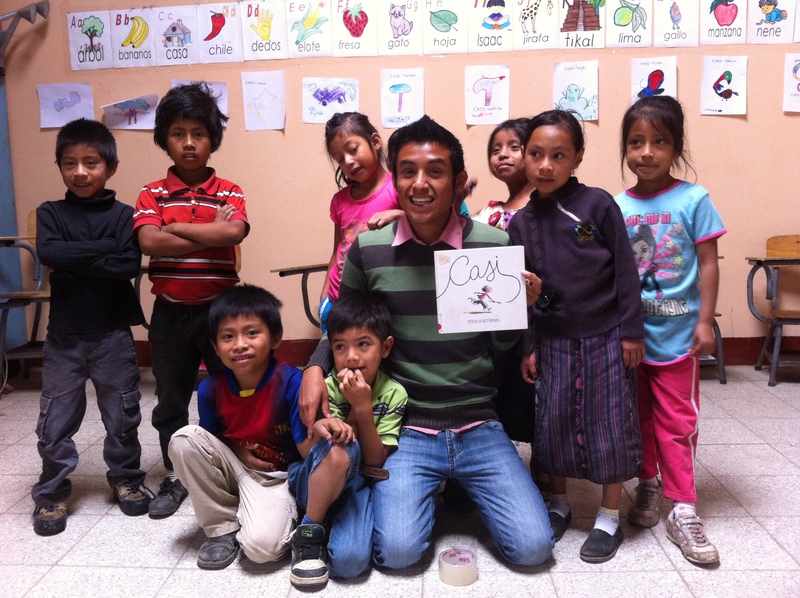 The classroom teacher gives Isais a warm welcome, allowing him to step in and lead the class. For the next hour, the students will be fully engrossed in the stories, songs, and activities Isais has planned, which also provide the classroom teacher the oportunity to observe and learn from Isaias’ creative teaching practices. As the students settle into their seats, Isais places a stack of books on each of the classroom tables. Within seconds, each book has found its way into the eager hands of a child, and the students begin reading about La Oruga Muy Hambrienta (The Very Hungry Caterpillar) admiring pictures of Casi Dibujos (Almost Drawings) and flipping through the pages of Un Beso en Mi Mano (A Kiss on My Hand). After Isaias has unpacked his materials and supplies for the day, he calls the students to the front of the room, singing a “Circulo” song and the children gather in the center of their classroom. More songs and movement follow, and students giggle as Isais engages them in silly songs where they imagine that they are elephants or airplanes. After many songs and much laughter, Isais asks the students to sit down quietly in the circle again – it’s story time. In this precious moment, the students forget about the ill-fitting shoes or over-sized shirt they might be wearing that day, they don’t notice the cold, hard floor beneath them, nor are they distracted by the sounds of roosters and dogs outside the doors. Despite the dim lighting, the students’ faces are lit up with wonder and joy as Isais begins reading them a story. 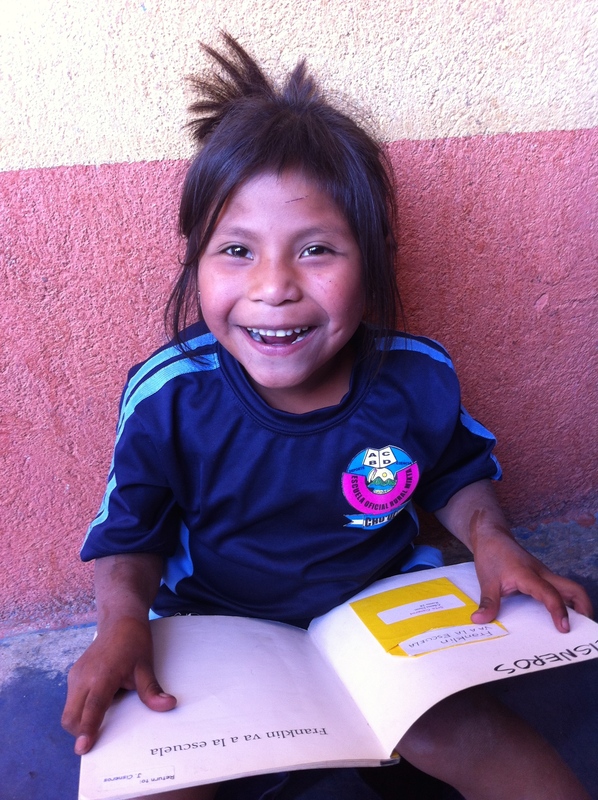 Story time is a sacred activity to the students of Chacaya II school, because it is not something that happens every day. There is hardly a story book to be found in the humble classroom in which the students spend most of their day. And while they study hard, learning to read and write and spell, often in a second language, the opportunity to engage with language through narrative, to enter the dynamic world of the story and activate the creative and abstract areas of their brains is only available to them through this program. The effect the program has on them is immediately visible through their alertness, excitement, and focus. As they listen to Isais animatedly read the book he has chosen for the day with a carefully created lesson plan, they journey with him outside of their classroom to other worlds, real and imaginary, learning to stretch their imaginations and hone their critical thinking skills along the way. After the story’s end, Isais begins a lively discussion with the students. He asks them to process and reflect through a variety of why questions. The group discussion allows the students to exercise reasoning and decision-making skills, develop the capacity to analyze information, and expand world-views. At this point, Isais asks the students to return to their seats and begins passing out recycled materials that the students will transform into an art project, related to the story they’ve just heard. Perhaps they will make beautiful birds out of old Compact Discs, a collage out of leaves collected from outside, or pages of a giant book out of newspapers. The students learn to follow instructions, express their creativity, and develop fine motor skills through these projects, which they are also proud to take home and share with their families. With the curriculum for the day finished, Isais departs Chacaya II school, hugging the students and wishing them well until next time. He’ll move onto another classroom for today, and tomorrow, he’ll wake up and begin his journey again with a different school, providing new students and communities with the benefits of the Traveling Library Program. His dedication and enthusiasm are two of the many qualities that make our program shine.